I’m honored to have introduced our new line of “snake bottom” heels and boots to some of the most influential tastemakers in Hollywood,” said designer Cedrick M.
New luxury shoe brand, Exotics By Cedrick, debuted at the Secret Room Events 2018 MTV Movie & TV Awards gift suite in honor of the Nominees on Thursday, June 14th, at InterContinental Century City in Los Angeles, California. The Tampa-based brand, known for its U.S. design patent for high heel outsoles swathed in leather snakeskin and encrusted with Swarovski crystals, was on full display at the exclusive luxury event; and interacted with media, celebrities, stylists and other notable guests. To commemorate June as national Pride month, the high-end brand also announced its ongoing philanthropic campaign to donate a percentage of sales to support HIV/AIDS research and prevention awareness. For more information visit the new website and enter to receive a 20% discount on future purchases: http://exoticsbycedrick.com. During the exclusive style and gifting lounge sponsored by 23andMe.com, Bubblelingo, and Welch’s among others, Exotics By Cedrick’s one-of-a-kind heels were featured on a 12-foot display covered in blush rosette fabric with a 4-foot Eiffel tower dipped in gold sparkle. Notable attendees included actors and actresses from blockbuster movies and hit television series such as the top-grossing film “Black Panther,” along with NBC’s “Law & Order,” ABC’s “Modern Family,” the CW’s “Jane the Virgin,” Showtime’s “Homeland,” and FX’s “Atlanta,” among others. Prominent guests received over $20K in Exotics By Cedrick gift certificates and lifestyle products. Rivet: Sassy leather pumps with 5-inch heel and one-inch platform; patent signature snakeskin outsole with Swarovski Crystals. Available in Black. Donatella: Sleek leather pumps with 5-inch heel and a single rose emblazoned on the back; patent signature snakeskin outsole with Swarovski Crystals. Available in Red. 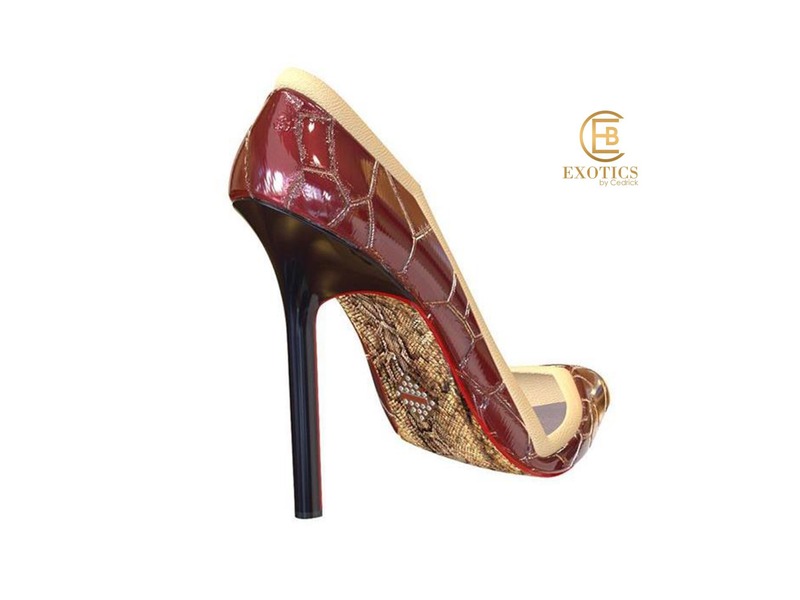 Regal Rachel: Elegant leather pumps with 5-inch heel; patent signature snakeskin outsole with Swarovski Crystals. Available in white. Majesty Mesh: High quality leather 4.5-inch heel designed to perfectly accompany a pencil skirt; patent signature snakeskin outsole with Swarovski Crystals. Available in Black. Sarae: Distinctively crafted leather 5.5-inch boot; patent signature snakeskin outsole with Swarovski Crystals. Available in Smoke Grey. To celebrate June as national Pride month, the high-end shoe brand announced its advocacy for the LGBTQ community with an ongoing campaign to donate three percent of all sales supporting HIV/AIDS research, sexual health awareness initiatives, and STD prevention education. Follow Exotics By Cedrick on Social Media: Instagram @exoticsbycedrick; Twitter @EXOTICS2016; Facebook @heelfrenzy. 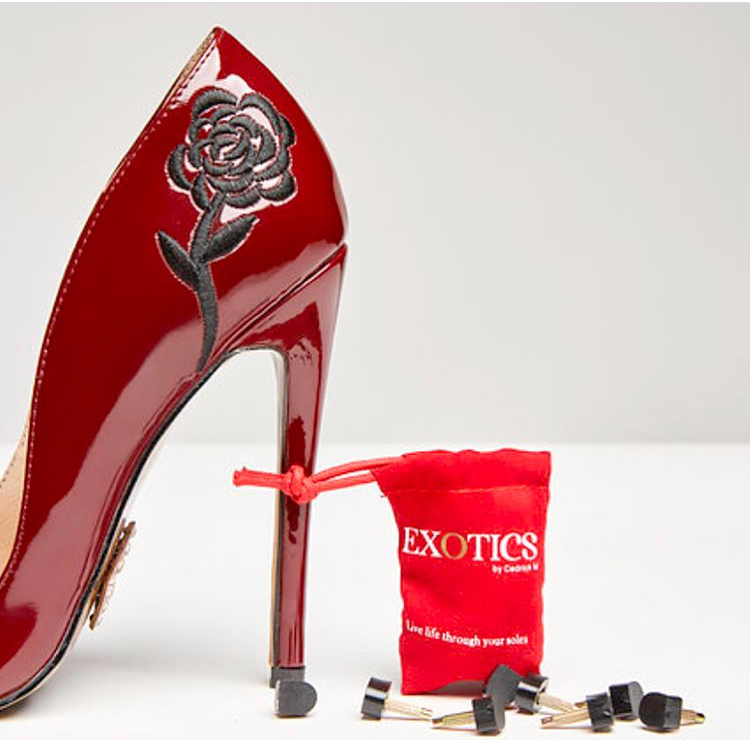 Exotics by Cedrick is a luxury womenswear shoe brand based in Tampa, Florida. Since inception in 2016, the brand has become best known for its signature patent design featuring a snakeskin outsole encrusted with Swarovski Crystals. Designed by Cedrick M., Exotics By Cedrick donates a percentage of sales to HIV/AIDS awareness and research. Website: http://exoticsbycedrick.com.